As the warm weather starts to return this spring, take the opportunity to explore Victoria’s lush landscapes with family and friends. Whether it’s romance or relaxation you’re after, Victoria’s fertile soils and fresh air have got you sorted! Victoria, despite being the second-smallest Australian state, has a rich variety of natural landscapes for those travelling south in spring. These destinations will have you marvelling at the marks left on the land by volcanic activity, and savouring the fresh and delicious produce that grows abundantly in Central Victoria. Hamilton, in south-west Victoria, is right in the middle of the Western Victorian Volcanic Plains (also called the Newer Volcanic Province). The plains are the third-largest in the world, behind the Deccan Plateau in India and the Snake River Plain in the United States, making them a world-class attraction. Hamilton once had its own claim to fame as the ‘Wool Capital of the World’; however, today it’s now a much quieter town, where the remnants and continuation of provincial life can still be seen. Visit the Hamilton Gallery to see paintings, ceramics, tapestries and many more artistic creations from the 18th, 19th and 20th centuries. The gallery also boasts the original planning drawings and paintings for the Hamilton Botanic Gardens, which are now more than 100 years old. The Sir Reginald Ansett Transport Museum is a nostalgic reminder of the once great Australian airline, and the heritage-listed Botanic Gardens are a perfect spot to relax afterwards. When the warmer weather strikes, Lake Hamilton is a great spot for fishing, boating, cycling and walking. Warrnambool is a great central place to settle in while visiting this part of the state. Here, you’ll have access to the surrounding coast, as well as to the southern parts of the Newer Volcanics Province. 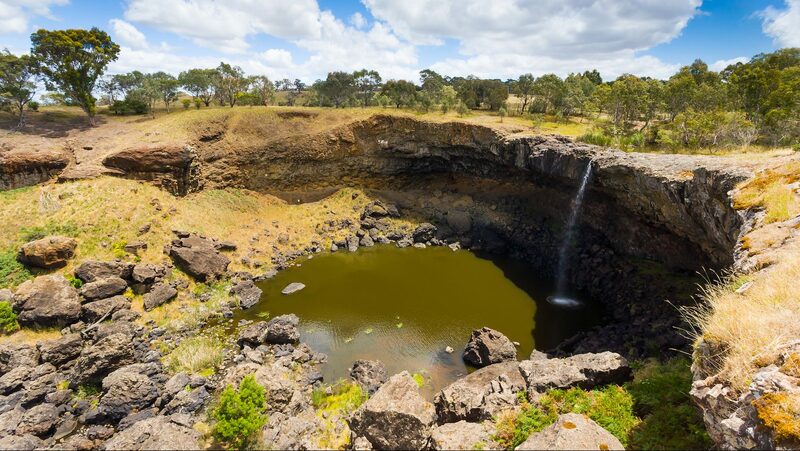 In Tower Hill, just west of Warrnambool, you’ll find one of the largest maar craters in the world. More than 25,000 years ago, magma rising from the depths met damp layers of sedimentary rock and caused the rock to explode, sending it flying into the air. The result is a three-kilometre-wide crater littered with baby scoria volcano cones. From Tower Hill, follow the coast to Port Fairy, and soak in the salty sea air and the quaint serenity of this small town. Spend the afternoon at the Whale Bone Gallery and the small glassblowing studio to get to know the locals and their crafts. For more volcanic scenery, visit the Mount Eccles National Park, the Mount Richmond National Park, or head east to The Sisters, which can be found 11 kilometres from Terang. For those interested in a bit of science-meets-history, the Terang Dry Lake Walk takes you around the tranquil lowland of the town’s southern edge. During this hour-long journey, you’ll come across the sites that have played a part in the town’s history. Whether in Heathcote, Kyneton, Castlemaine or further north in Shepparton, you can find a range of activities to satisfy your palate in Central Victoria. Spend a day picking at Belstack Strawberry Farm on the banks of the Goulburn River in Kialla, and follow it up with a visit to the SPC Factory, where you’ll find yourself on the doorstep of the Goulburn Valley. Make some room for plenty of delicious take-home goodies that you can pick up at the factory! About an hour’s drive south-west, the Pink Cliffs Reserve in Heathcote makes for a splendid afternoon adventure; get there in the middle of the afternoon to watch as shadows engulf this colourful geological wonder. McIvor Creek is a pleasant spot for a leisurely stroll, and Dargile Reserve nearby offers a campground right among the ironbarks, grass trees and wildflowers.